For those without comedic tastes, the "questionable parody" of this website called Wikipedia have an article about Passion of the Christ 2. Passion of the Christ 2: Crucify This is the hit sequel to Mel Gibson's highly controversial movie, Passion of the Christ. It was released on July 15, 2005 and grossed over $1 dollar. 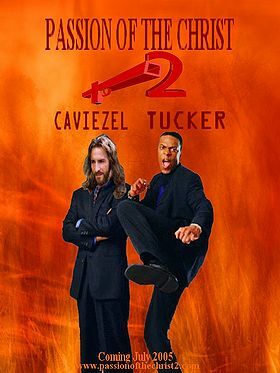 Jim Caviezel returns in his role as Jesus accompanied by new sidekick, Detective Jim Brown, played by comedian Chris Tucker. Passion of the Christ 2 picks up where Passion of the Christ left off, after Jesus ascended into heaven. Once Jesus arrives in heaven, God informs him of Satan's evil plan to travel to the year 2005 and cause unrest and destruction. Unfortunately for God, however, he was unable to find out anything else about Satan's diabolical plan. God does not however, have a very strong hunch that Satan is planning to do more than just cause unrest and destruction, so he instructs Jesus to follow Satan to the year 2005 and to stop him from destroying the future. Jesus then goes after Satan who opens a time portal to the future, laughs maniacally, and escapes. Jesus goes through the time portal after Satan and ends up in modern-day New York. Once Satan arrives in New York, he takes the form of a mob boss under the name Don Natas, and quickly establishes a criminal empire. To beat Satan, Jesus must team up with Detective Brown (Tucker), (A marijuana smoking cop with the voice of a cat in heat) and shoots his way through the demonic criminal networks of New York to subdue the evil prince of Darkness! Jim Caviezel - As The Real Motherfucking Jesus Christ! Mel Gibson - Drunken anti-semetist who almost runs Jesus over in his sports car. Jack Black - Heavy Metal Rocker who converts to Christianity after meeting Jesus's sidekick, Detective Brown. This page was last edited on 11 October 2018, at 18:32.